I’d heard of it ….. Yahoo Pipes that is, but didn’t really give a look see until yesterday. The reason, well RSS feed reading, as in the physical task of going through reading a feeds content. I’ve got a good few to get through and I was finding it a little frustrating recently, so I went to Yahoo Pipes, created a single feed that’s a union of Read/Write Web, Mashable and TechCrunch and filtered the feed on one single criteria ….. the content must have the word ‘mobile’ in it. Today was my first attempt to see if it was worth doing. So out of a possible 75 news items from Read/Write Web, Mashable and TechCrunch I had just 10 items in my Web 2.0 Mobile News from Yahoo Pipe. 2) and this news item published by David Recordon on France Telecom’s support for OpenID!. Now that’s a big news item. And what did the filter miss that I might have been interested in. Well there were at least 7~8 stories I would have taken a look at but hey the filter would never have caught them anyway. 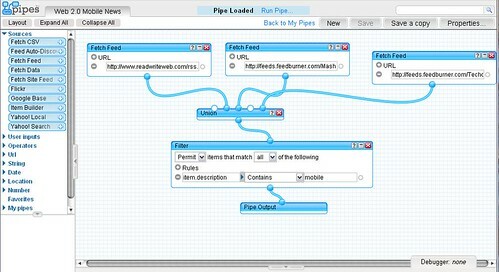 So for me it’s a success and I’m off to Widsets to create a widget of this Yahoo Pipe on my phone. Seriously can we design the Future Internet. Well one of the items we’re going to have to look at is ‘How’ people will use the internet in the future. Well others have tried to predict future technologies and the next couple of videos are not a bad attempt. From 1967 the Philco-Ford Corporation released the following video which holds some predictions for home computer use in 1999. Now I must say this isn’t a bad attempt, and in looking at it, it may be too accurate, but the folks over at Boing Boing seem to confirm that it was a true release. Both these concept videos nearly hit the mark, while maybe a little off on the social aspects of ‘their’ tomorrow, and while overall we’re not quite in that future world, the point is we must imagine ‘again’ before we can deliver. Well the call is out, TridentCom 2008 is inviting you to submit a paper in the area of test beds and research infrastructures for the development of networks and communities. We’ve recruited 3 excellent technical programme co-chairs this year, from the EU, Frank Steuer of the Technische Universität Berlin, Germany, Laurens Cloete of the Meraka Institute, South Africa and Raheem Beyah of the Georgia State University, USA and so I believe we are in good shape for hosting an ground breaking conference. Also with the conference being held in Innsbruck, Austria, a location between high Alpine mountains, it serves as an ideal place for skiing and mountaineering. There are several ski resorts around Innsbruck with the Nordkette served by a cable car and additional chair lifts further up. Other ski resorts nearby include Axamer Lizum, Igls, Seefeld, Tulfes and Stubai Valley. Add this to your 2008 calendar! On the 18th of July last I was asked to present at an Enterprise Ireland information seminar in Waterford, highlighting the opportunities and support structures for Irish SME’s to become involved in projects within the EU 7th Framework Programme. As the Framework Programme 7 presents fresh opportunities for SME’s, via the “Capacities Research for the Benefit of SME’s” Programme, to engage with other European partners, this seminar was put in place to provide an opportunity for delegates to hear first hand from experienced framework participants and the opportunity to network amongst their industry and third level peers. My presentation “Experiences of an Irish Researcher in FP6” can be found on the link provided and is also embedded below. The event was well attended and I enjoyed giving the presentation. Given that the deadline for FP7-SME-2007-1 just closed an hour ago I thought it might be an idea to release this entry and get people thinking about the next Call.